Omaha, NE – On April 23, 2018, Legislative Bill 670 (which included Legislative Bill 826 as an amendment) was signed into law by Governor Pete Ricketts. LB 826 was introduced by Senator Tony Vargas on January 4, 2018. The bill ensures that vulnerable youth in Nebraska can continue to access the relief for which they are eligible and that is in their best interest. This amendment clarifies and reaffirms that Nebraska State courts—who are tasked with making determinations regarding the custody and care of juveniles—have the jurisdiction and authority to make factual findings related to (1) whether a child has been abused, abandoned, or neglected, (2) whether parental reunification is viable, and (3) whether it would be in the child’s best interest to be removed to his or her country of nationality. Such findings are crucial for immigrant youth in the United States seeking Special Immigrant Juvenile (SIJ) relief. SIJ relief can lead to work authorization, permanent residence, and eventually U.S. citizenship. 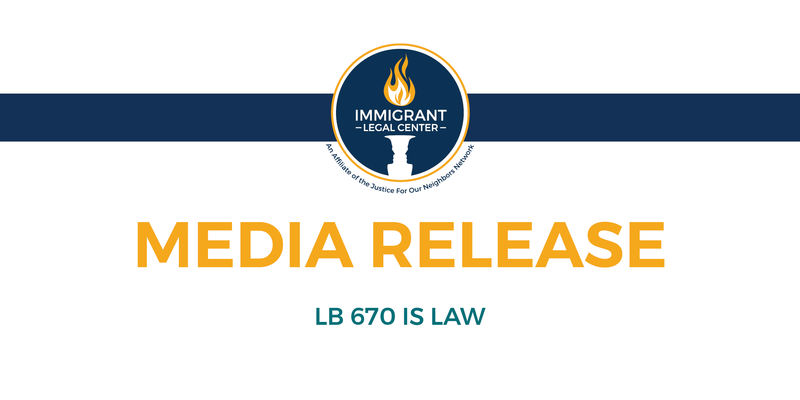 Interviews are available with ILC attorneys and former clients in relation to LB 670.